Supernatural horror is something so abused and so overcooked that a contemporary entry to this genre will struggle to gain limelight; clichés of endless jump scares and generic demonic antagonists are adopted by most films of this tired category, but these conventions don't necessarily equal bad quality - solid execution of such conventions by someone who knows what they're doing can truly bring a supernatural horror to life, as proven by this year's Sinister. True crime writer Ellison (Ethan Hawke) moves into a new home with his family, secluding the secret that a murder took place on the site many years before. Using this as inspiration for his next book, Ellison soon stumbles across a box of dusty super 8 home videos depicting further murders from the past, all linked by a strange symbol and a ghostly, pale skinned figure. As the atmosphere of the house becomes increasingly unsettling, Ellison soon realises his desire for a narrative basis unveils a menacing chain of mysterious homicides; his attempt to piece together the evidence, however, only lures the disaster closer. 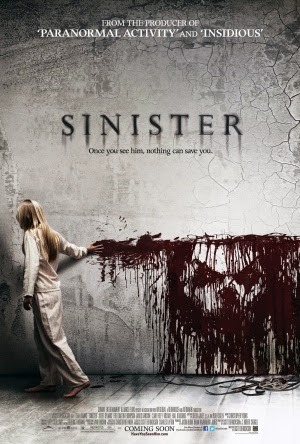 Sinister is conventional; that's one to clear up before anything. Dark settings, nighttime scares, loud noises, scary screams. It's all here, compiled alongside a fairly standard but gripping storyline with some emotional depth. There is some expert tension during the film's silent sequences, particularly toward the very end, and the jump scares pierce the dreading silence in an effective manner. It goes without saying though that the jump scares develop into something extremely irritating as everything progresses, becoming lazy ways to culminate a wave of tension and in most cases have no solid outcome. The narrative can feel a bit dreary and sluggish when things kick off and toward the middle portion; the malevolent deity is used a bit too sparingly and thus doesn't feel as cemented into the overall plot as it could've been, instead being shunted a little bit to the sidelines despite having some truly shocking moments. The storyline is backed by some very strong acting, particularly by Hawke himself who grasps the personality of his character brilliantly whilst portraying a convincing scaredy pants act. The only area where the acting dips is with his wife Tracy, played by Juliet Rylance who seems to rehearse her strange accent rather than act an interesting character. Sinister is a wonderfully shot and well plotted fare, supported by strong performances and well executed genre conventions. It isn't perfect - but for an entry to a genre so lacklustre in modern times, it's a refreshing experience and one that will truly exude some chills.